As a conductor and string co-ordinator, he has worked for Robyn, Fibes, oh Fibes and Natasha Bedingfield to name a few. At the moment Martin is the master mind behind the succesful concert and album Timo Sjunger Ted, where Timo Räisänen together with Gothenburg Wind Orchestra interperets the classic songs of Swedish legendary songwriter Ted Gärdestad. 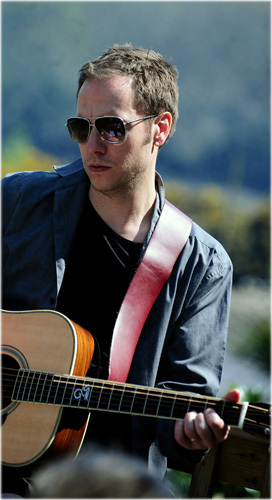 Martin mainly writes for the band West of Eden of which he has been a member since 1997. With nine band albums, a 2008 solo album and a duo album with his wife Jenny under the belt, Martin has proved himself as one of today’s leading songwriter in the contemporary Celtic music scene. Martin started off playing the violin when he was four years old, and hated it! As soon as he was old enough to have his own saying, the violin was out of the window. Instead he taught himself how to play piano, and today he would consider that to be his main instrument. Besides the piano and the keyboards, Martin also plays Acoustic Guitars, Mandolin, Cittern, Dobro and Accordion (though not on the same time) with West of Eden. You might have seen Martin on stage when performing with acts such as with Timo Räisänen, Sanna Hogman, Rebecka Törnqvist, Magnus Carlson (from Weeping Willows), Sofia Karlsson, Ebbot, John McCusker and more.